The IT industry is about as competitive as they come, and even if you do make it to the top, there's no guarantee you'll stay there. 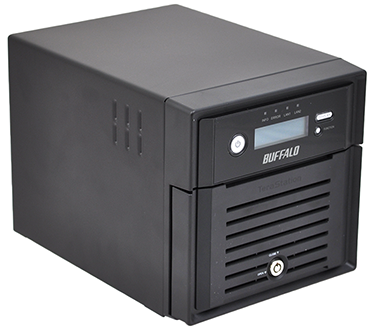 Buffalo was once a go-to provider of network-attached storage solutions, but in recent years the firm's products have been overshadowed by competing solutions touting an ever-growing array of features and greater performance. The likes of Synology and Qnap have stolen a march on what Buffalo has to offer, but the Japanese firm is hoping to claw-back lost market share with revamped additions to the LinkStation and TeraStation product lines. 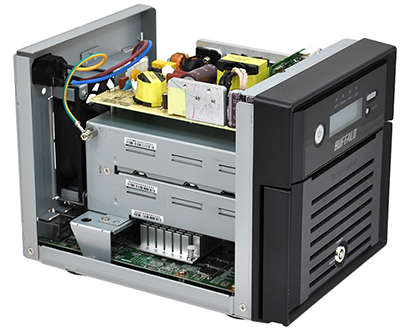 Having covered the former late last year, we're now turning our attention to the new TeraStation 3200. Described as "ideal for the home office and small and medium businesses (SMB) looking for reliability and performance," the TS3200 is available pre-configured in a choice of 2TB (£320) 4TB (£400) or 8TB (£520) capacities. There isn't, sadly, a diskless option, yet the pre-configured models do have the advantage of initialised, ready-to-use RAID arrays, saving time when it comes to setup. Measuring 230mm x 170mm x 170mm in size, Buffalo's chassis is somewhat large for a dual-bay NAS, yet build quality and appearance conform to small-business expectations. The front of the unit provides a useful display for at-a-glance status information, while both pull-out drive bays are tucked neatly behind a lockable plastic door that helps prevent unwanted access. The bulk of the connectivity options are around back, where the pertinent ports include two USB 2.0 and dual Gigabit Ethernet. We're surprised to find that USB 3.0 doesn't make an appearance and feel that this is an oversight on Buffalo's part - we can't think of a genuine reason for any 2016 NAS not to support the faster standard. 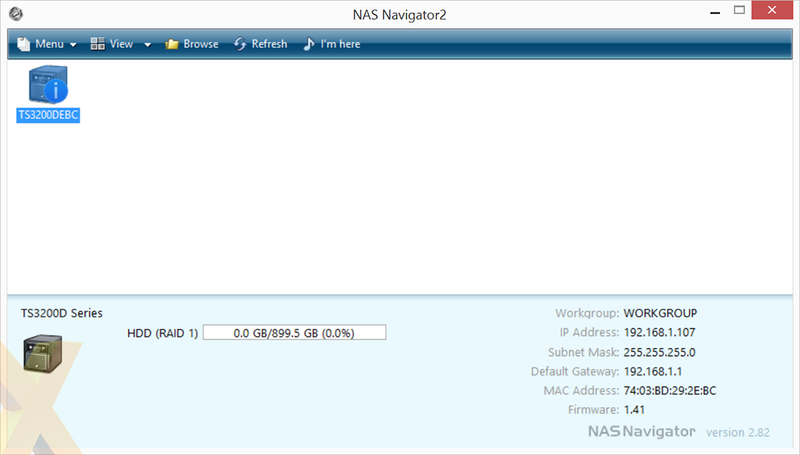 Our 2TB review sample comes equipped with a pair of 1TB Toshiba DT01ACA100 drives installed in a RAID 1 configuration. Another somewhat unexpected choice, as many rival manufacturers have made the transition to NAS-optimised drives from the likes of WD and Seagate. 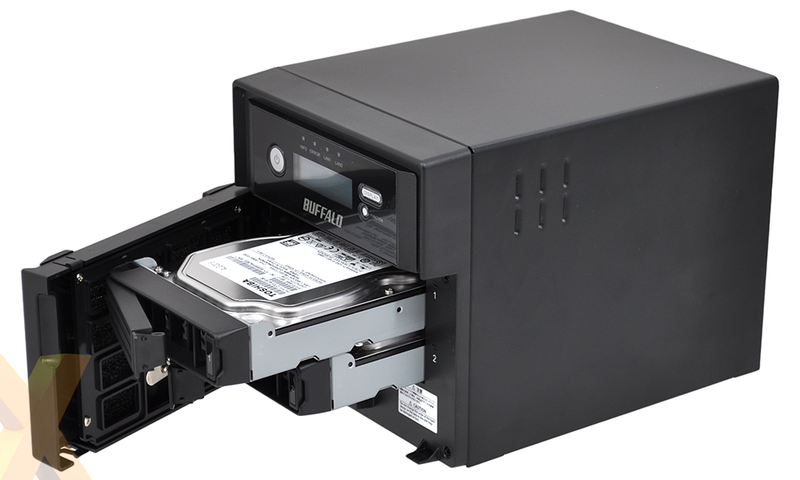 On the plus side, both bays are hot-swappable and one of the TS3200's genuine attractions is a three-year warranty that promises a 24-hour hard-drive exchange in the event of failure. We haven't tried the service for ourselves, but it sounds rather useful: contact Buffalo support, they arrange for a replacement drive to be with you within 24 hours, then send your faulty drive back within 30 days. The rest of the included hardware pulls no surprises. 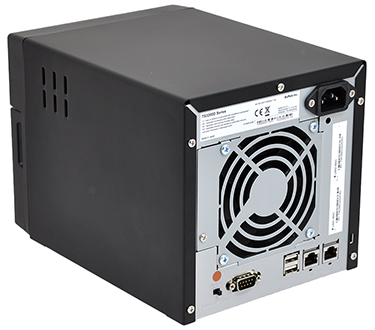 A built-in PSU accounts for the chassis' overall size, though better components would have been appreciated as coil whine can be an issue. At the bottom of the unit, the heatsink-equipped motherboard is home to a 1.33GHz, dual-core Marvell Armada XP MV78230 CPU and 1GB of DDR3 memory. 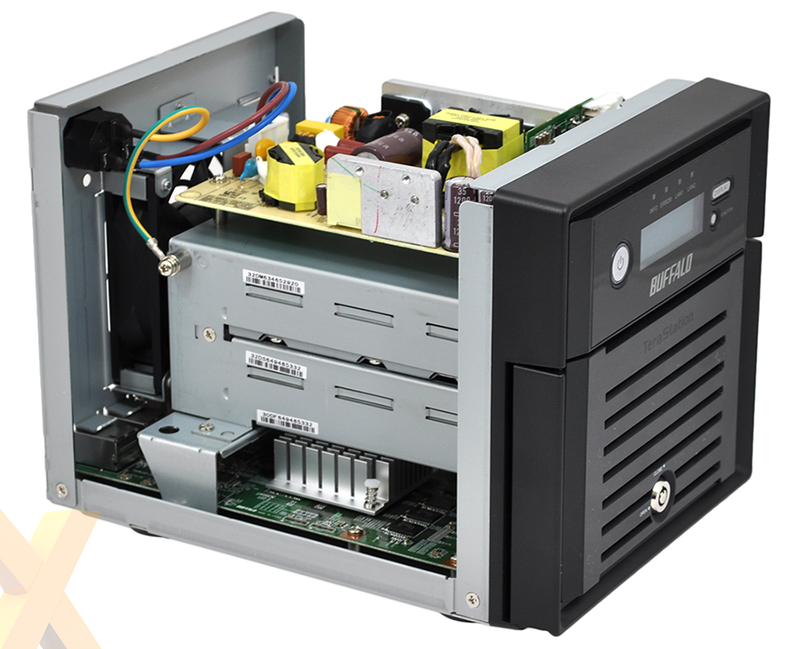 The entire unit is cooled by a single rear fan which is neither particularly quiet nor overly loud, and can easily be removed for cleaning. 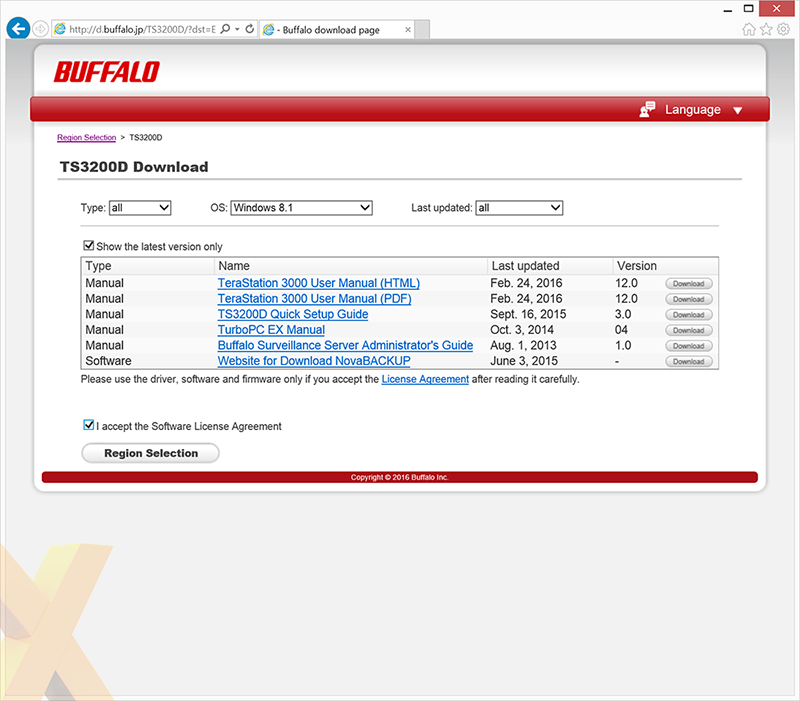 Software has come to play an increasingly important role in the modern NAS experience, and on first impression Buffalo is some way off matching the experience available from the competition. 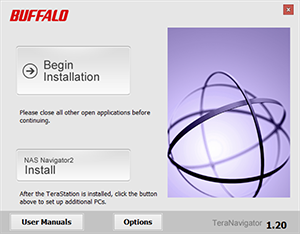 According to the manual, the initial configuration entails running the install software from the bundled CD, or by downloading the TeraNavigator utility from http://d.buffalo.jp/TS3200D. We couldn't find the utility at the above URL, so opted to dig-out an old optical drive. 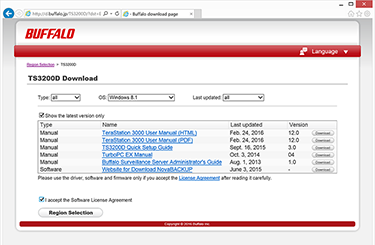 Installing the utility is simple and straightforward, and Buffalo is clearly targeting business users who may prefer an offline setup process as opposed to the web-based wizards on offer from the latest consumer units. 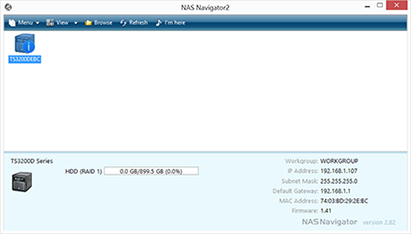 NASNavigator2 is a lightweight package that essentially makes it easy to locate a server on the network and map shared folders at the click of a button. It's helpful to have, but there does appear to be a lack of continuity throughout the various setup components - the website, finder utility and admin panel feel disjointed and the TeraStation hasn't benefited from the software revamp applicable to the consumer-orientated LinkStation. Utilitarian in appearance, the TS3200 admin panel covers most of the essentials without pushing the boat out. Logically laid out and reasonably swift in response, the server's various functions are managed via a left-sided main menu that leads to various configuration options on the right. The layout doesn't encourage multi-tasking, yet it's a tried-and-trusted method that has suited networking products for many years. Supported features include Active Directory, iSCSI target and replication across multiple TeraStations on a network. Creating users or user groups is a cinch, and Buffalo includes some of the extra niceties you'd expect from a modern-day NAS. These include built-in Print, FTP, DLNA and BitTorrent clients, an IP camera suite and a range of local or cloud backup options. Multi-PC offices may also appreciate the fact that the TS3200 is bundled with 11 NovaStor NovaBackup licenses as standard. While not as feature-rich as, say, a Qnap TS-251+, the Buffalo TS3200 is serviceable, costs less, and includes disks as part of the £320 price. Let's now see if performance is up to scratch.